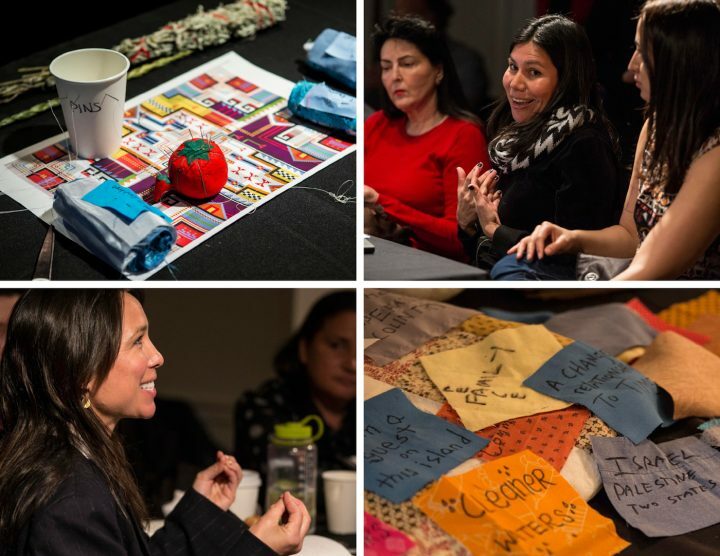 Conceived by artist and choreographer Emily Johnson (Yup’ik), the sewing bee and roundtable discussion will be led by a council of indigenous women. It is only recently that Native Americans have garnered some degree of autonomy over how their images and stories are portrayed, their voices having been largely shut out of mainstream culture for hundreds of years. This Sunday at the Ace Hotel, the Los Angeles Performance Practice will host Umyuangvigkaq: Yaanga, a durational sewing bee and round table discussion which places indigenous women at the center. In Yup’ik, Umyuangvigkaq means “a place to gather ideas,” and “Yaanga” is the Tongva name for the traditional land that is now Downtown Los Angeles. A previous Umyuangvigkaq was held in New York in January 2017. Conceived by artist and choreographer Emily Johnson (Yup’ik), the event will be led by a council of indigenous women including Karyn Recollet (Cree), Cindi Alvitre (Gabrieliño/Tongva), and textile artist Maggie Thompson (Fond Du Lac Ojibwe). Over the course of six hours, participants are invited to join in a communal sewing bee where they can stitch messages onto quilt squares, which will become part of Thompson’s collective project to create 84 hand-sewn quilts. They will also be incorporated in Johnson’s all-night performance Then a Cunning Voice and A Night We Spend Gazing at Stars. As participants work with their hands, the event organizers will lead discussions by offering provocations that will change roughly every hour. This will be the culminating event of the Indigenous Choreographers at Riverside gathering. The event is free but reservations are recommended.